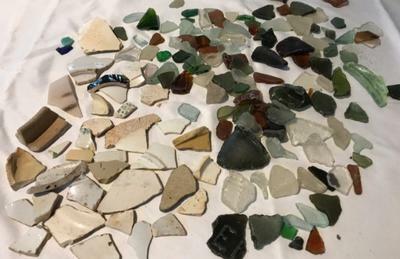 A highlight of my cruise to New Zealand this year was the great finds of Sea Glass and Pottery Shards on the beach at Akarowa, New Zealand. Having found examples there once before, I was looking forward to adding to my collection and this year's finds sure have done that. Lots of different colours and a plethora of great pottery shard pieces were found this time. The area to scrounge through is easy to find and very accessible. Standing on the pier, the beach is to the right where most of my finds were collected. The morning of the 14th January, I set off on one of the ship tenders towards the Akarowa shoreline. 15 minutes later I was walking along the pier, drooling at the thought of what I was going to find. Was my 1st experience several years ago just a fluke, or was this beach truly a treasure trove for collectors? Well, no fluke. Take a look at the finds.